Would You Like To Be A Tennis Warrior? No need to change your tennis strokes - just your thinking! Play more instinctive, automatic, controlled, and relaxed tennis, and win more! Welcome to my web site. My name is Tom Veneziano. 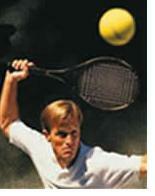 I have been a tennis pro teaching in Houston, Texas for over twenty-five years. Twelve years ago because of injuries I was forced to retire from the game of tennis. Fortunately I did not have to retire from teaching tennis. Although I could no longer hit tennis balls I survived by using a ball machine and group lessons. Because I was now on the sideline (like a basketball coach) using my mind and watching my students play, I developed a whole new perspective. That perspective combined with what I had learned from my first fifteen years of teaching slowly evolved into a unique tennis system to help players learn mental toughness as well as stroke production. I have developed my own technical language to help convey tennis principles and concepts to my students. My system is called the Tennis Warrior System and can help you think like a pro. What Is A Tennis Warrior? This web site is one of the media I have chosen to help players understand not only mental toughness, but the truth about learning the game of tennis. I have taught thousands of players to think like a pro with my Tennis Warrior System. I am constantly at work writing down more and more of my system in book form and audio tapes. To date I have one book, two booklets and 3 audio CDs and over TEN YEARS of archived tennis lessons from the voice mail Tennis Lesson Hotline and the email newsletter. Plenty more to come so keep your eye on my web site. Thanks for stopping by and enjoy my web site!